Well, I’m getting this post up just in time for the end of Hannukah and the beginning of Christmas. We celebrate both in our household and I thought these were a nice alternative to the traditional Christmas cookies I normally make. Not to mention they’re gluten-free and egg-free. Bonus. I had never made these before, but was so glad I did this year 🙂 Monkey Man gave them a thumbs up and a “tastes just like the real thing”. The connection between rugelach and Hannukah is not exactly clear but here’s what I found from a post on Epicurious.com. “Only one person could clear up this Jewish holiday baking conundrum: Gil Marks, author of theEncyclopedia of Jewish Food. 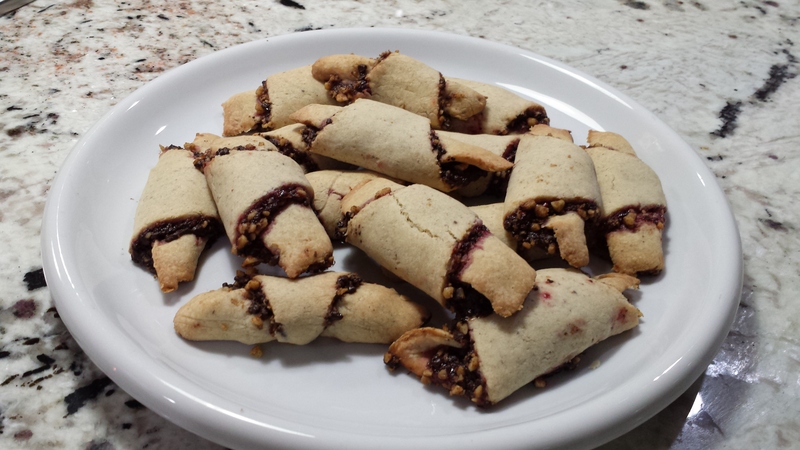 Marks explained that rugelach are often associated with Hanukkah because of the Book of Judith. As the story goes, when the Assyrian army was about to invade Jerusalem, Judith fed an Assyrian general copious amounts of salty cheese or milk, followed by gallons of wine. The general was then so intoxicated that Judith was able to behead him with his own sword. With no general, the invading army fled, and Judith’s people were saved. Eating dairy during Hanukkah is about celebrating this miracle. My food processor made this all very doable. I recommend using one for this recipe. Let’s talk about timing. You’re going to first make the dough. That takes about 5-10 minutes. It’s pretty sticky so it’s needs to chill for a while. 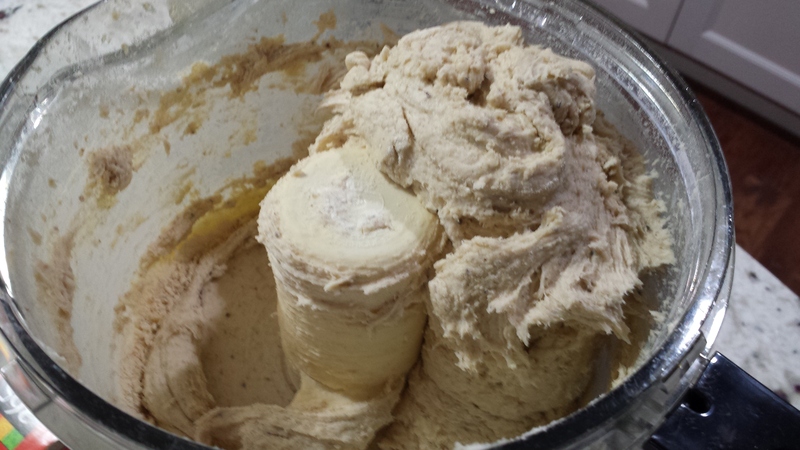 Once you make the dough, you’ll need to let it chill for about 30-45 minutes before rolling it out. 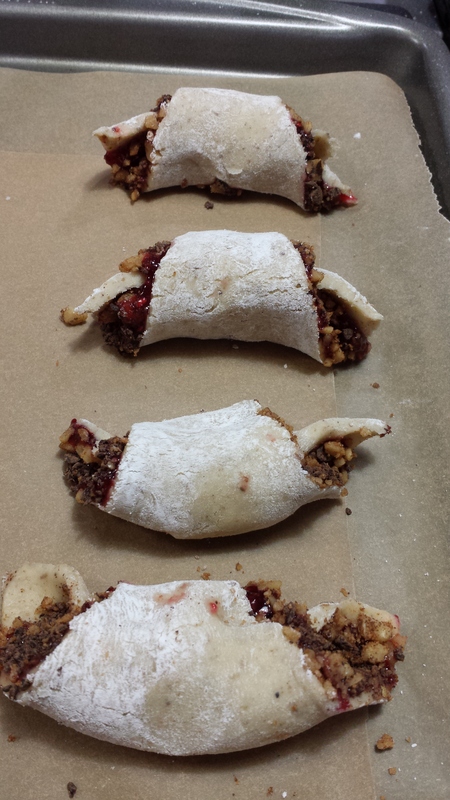 Then you roll it out, layer it with the filling, and roll the rugelach. That’s another 20 minutes because you’ll do it four times. Then you bake the rugelach for about 20 minutes. That’s about 1.5 hours from start to finish, so plan accordingly. You are certainly welcome to make the dough the day before and refrigerate overnight. You can even make the rugelach and refrigerate overnight and then bake the next day. The timing of this recipe is forgiving in that way. However, if you chill the rugelach after they are rolled, they don’t brown as well (consequence of gluten-free flour). 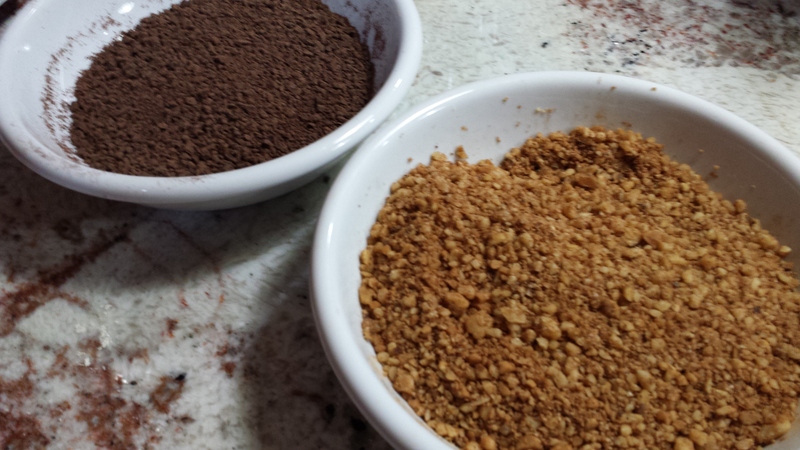 First, I mixed the two flours (1/2 c. of Glutino and 2 1/2 c. of Bob’s Red Mill) and set aside. You can probably get away with using just the Bob’s Red Mill. Next, mix the ground chia seeds and water in a small bowl. You want it to develop the consistency of snot – really. 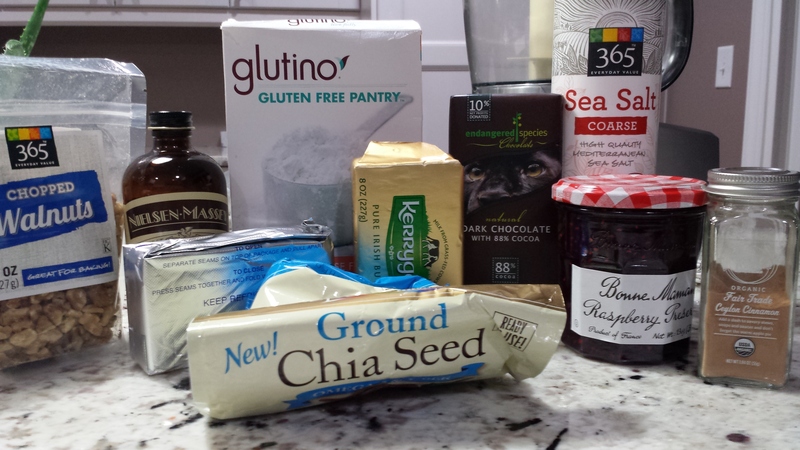 I use ground chia seeds because they add some elasticity without having to use xantham gum or guar gum. 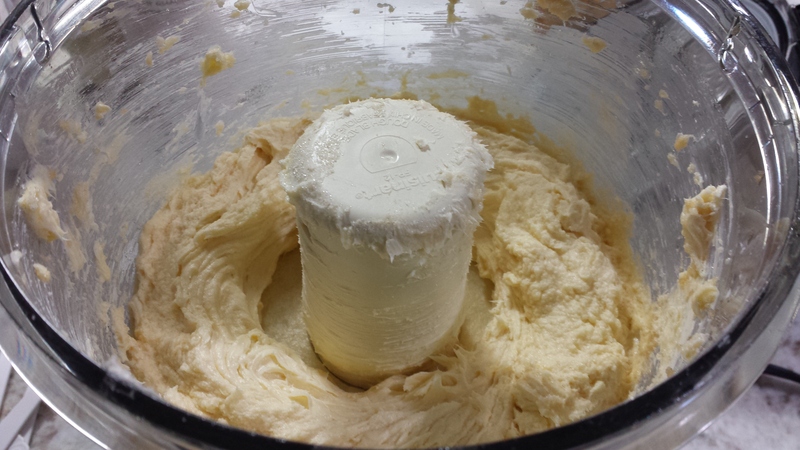 In the food processor, add the cream cheese and butter and cream. Next, add the salt, vanilla, granulated sugar, and chia snot. Mix well. Add the flour, in about three or four additions. Don’t over mix the dough though. Just mix until combined after each addition. 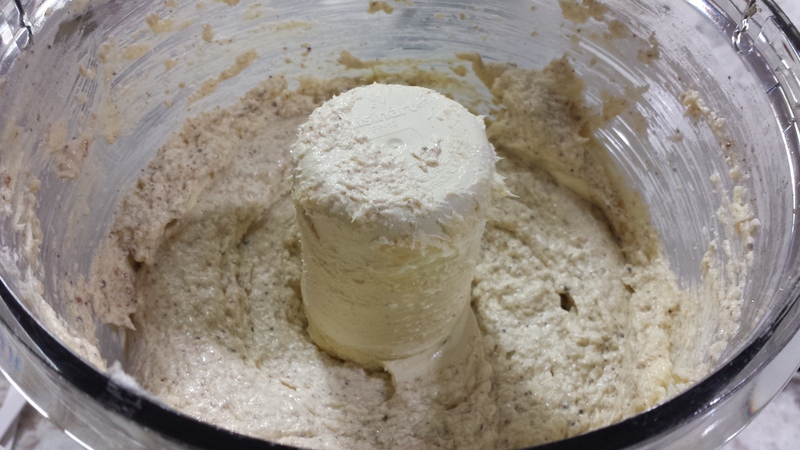 By the fourth addition of flour, your dough should start to stick together in the food processor – like so. Have some extra flour set aside for rolling out the dough in a small bowl. I used tapioca flour. Generously flour a piece of wax paper on a large surface (for rolling out the dough later). 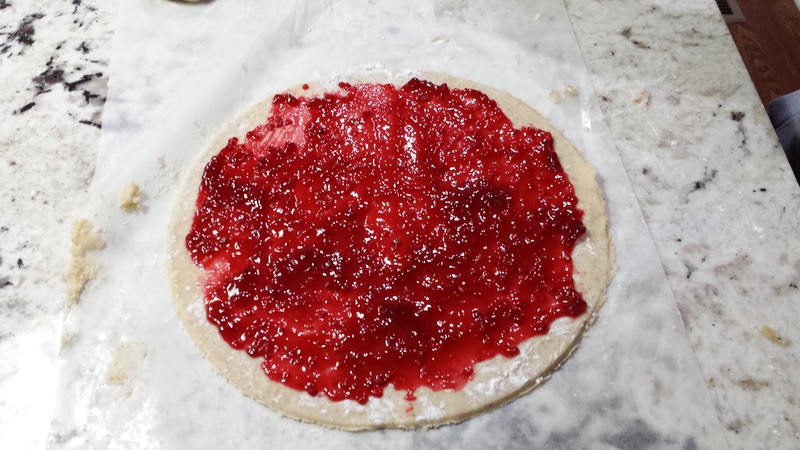 Ball the dough on the wax paper and dust with additional flour to ensure it doesn’t stick. Next, using a knife, cut the ball into quarters. Makes four discs from the quarters. 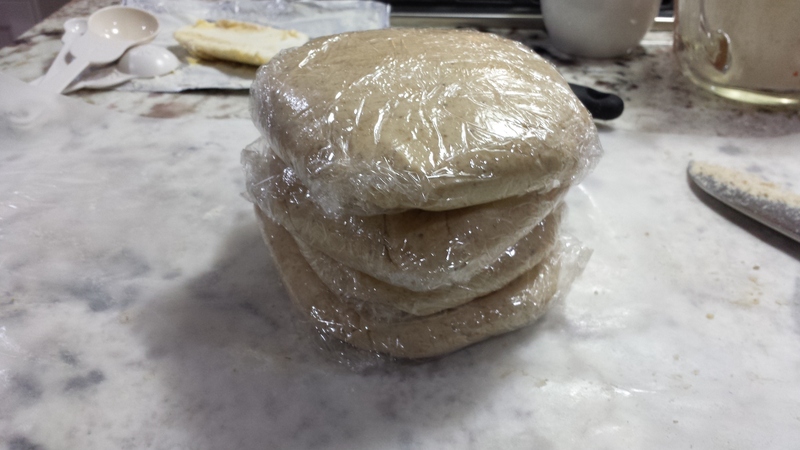 Then wrap the discs with plastic wrap and place in the fridge for 30-45 minutes. How will you know when the dough is cold enough? If you try to roll it out onto a well floured piece of wax paper and it still sticks, you need to chill the dough longer. If that’s the case, ball it back up, form it into a disc, rewrap and place back in the fridge. Now is a great time to get your filling ingredients prepared. I used a small food processor to finely chop one cup of walnuts and one bar of chocolate. A lot of recipes call for brown sugar be added to the walnuts along with the cinnamon, but I decided that the preserves and the chocolate were sweet enough, so I left it out. If you like super sweet sweets, go for it. Add 1/2 c. brown sugar along with the 2 t. of cinnamon and mix in with the walnuts. 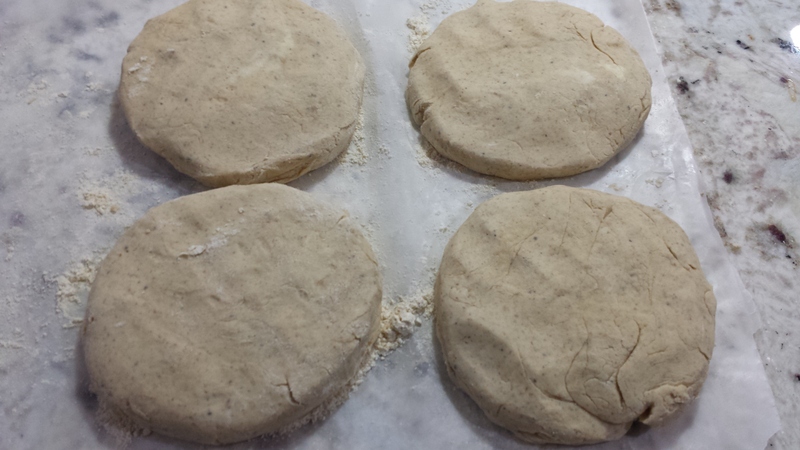 Once the dough is cool enough, roll out each disc with a rolling pin between two pieces of wax paper. Dust with flour as needed to ensure that the dough does not stick. 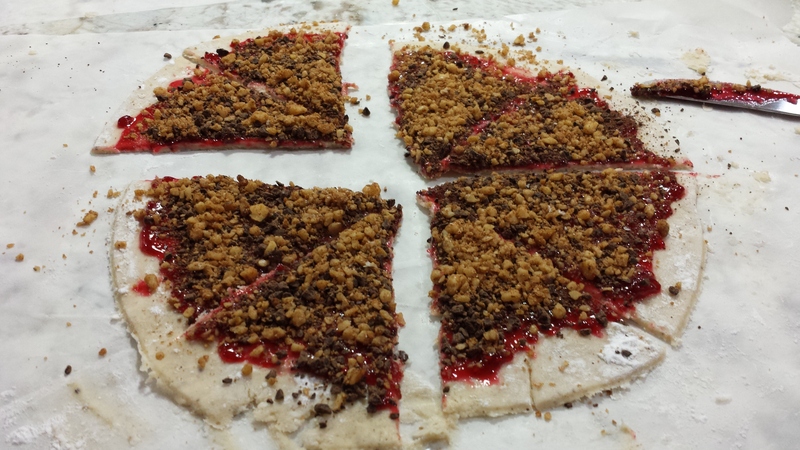 Double check it’s ability to pull away from both pieces of wax paper (both sides) before layer with the filling. If one side is stuck and you move onto the next step, you have a lot of trouble rolling up your rugelach. Note, I used my 9″ spring foam pan to cut my rolled out dough into perfect circles. 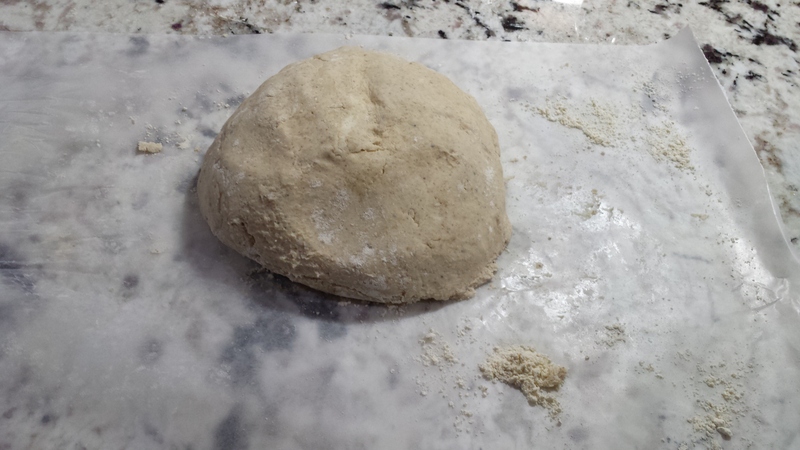 Add two heaping tablespoons onto the middle of the rolled and trimmed dough and spread evenly across the dough. Next, layer with the chocolate and walnuts (a handful or so of each). Cut the dough into 8 pieces. Start with the long edge and roll each slice. Place on a cookie sheet with the tip tucked underneath and the edges curved in slightly. If egg is not a problem for you, feel free to beat an egg and brush each cookie with egg wash and sprinkle with a bit of granulated sugar. I was sharing these with a friend that is allergic to eggs, to these were made sans egg wash. I also didn’t think they needed the extra sugar. Aesthetically speaking, I’m sure that would have made them look “va va voom” – for a cookie. Bake for about 20-22 minutes. I liked when mine browned a bit on top, so I kept them in for an extra minute or two. Pull them out and allow them to cool on a wire rack. There are about a million varieties of these that you have fun with. Apricot preserves is a popular filling (but I’d add a little nutmeg to the walnuts in addition to the cinnamon). I’m thinking about trying blueberry preserves with cardamom next, or maybe cherry preserves and white chocolate. A quick note, if you freeze the rugelach before baking, make sure you let them defrost for about 20 minutes before placing them in the oven. 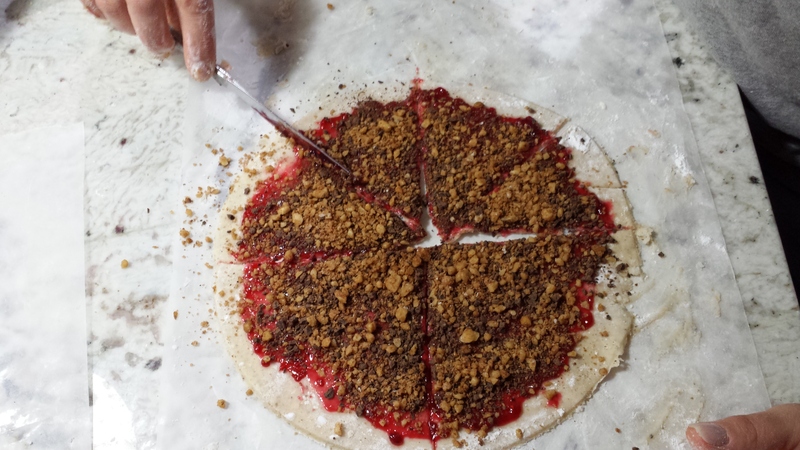 This entry was posted in baked good, chocolate, cookie, dessert, has dairy and tagged butter, cinnamon, cookie, cream cheese, egg-free, gluten free, hannukah, raspberry preserves, rugelach, walnuts. Bookmark the permalink.